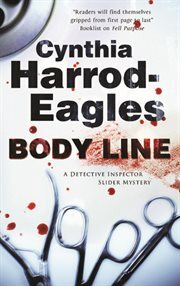 The item Body line : a Bill Slider mystery, Cynthia Harrod-Eagles, (electronic resource) represents a specific, individual, material embodiment of a distinct intellectual or artistic creation found in Austin Public Library. The brand-new Bill Slider Mystery - David Rogers was a doctor, handsome, charming and rich. He lived the lifestyle of a consultant - expensive clothes, top restaurants, exclusive clubs - until someone killed him in the hallway of his lovely million-plus-pound house. But when Bill Slider and his firm are thrown into the mystery, they soon discover that nothing is as it seems, for though David's girlfriends are plenty, none of them can tell Slider anything about where he worked or what exactly he did . .